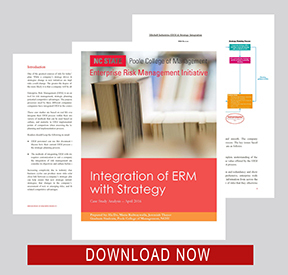 NC State University’s ERM Initiative is pleased to release a new thought paper, Integration of ERM with Strategy, that highlights three case study illustrations of how organizations have successfully integrated their enterprise-wide risk management efforts with their value creating initiatives. These case studies are based on real life examples of how companies have attempted to better integrate their ERM process within their strategic planning process. While a company’s strategy drives its value creation, it also entails risk-taking; when strategies change or new initiatives are implemented, new risks may be introduced or existing risks could change. The greater the degree of integration between strategy and risk management, the more likely it is that a company will be able to successfully implement its strategy. This thought paper, which was developed by three NC State graduate students completing coursework in ERM, provides three unique illustrations of how organizations have successfully connected their risk management and strategy execution efforts. The three cases reveal the variety of methods that can be used based on a company’s strategic objectives, business model, culture, and maturity in ERM implementation. This report, also highlights key takeaways as points of comparison when assessing the level of integration between ERM and the strategic planning and implementation process. It is our hope that boards of directors and senior executives can use this document to assess their organization’s level of integration and discuss how their current ERM process can be improved and be more closely aligned with the strategic planning process. 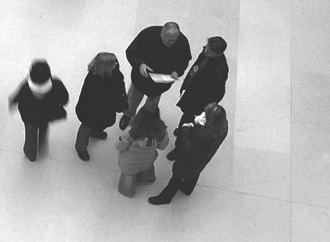 The three different approaches illustrated in this thought paper help remind readers that just as ERM requires customization to suit a company’s unique objectives, culture, and business model, the integration of risk management and strategic planning also requires a company to consider its objectives and culture before deciding the best way to align the two processes. We hope you find this report beneficial to increasing the value provided by your organization’s ERM efforts.